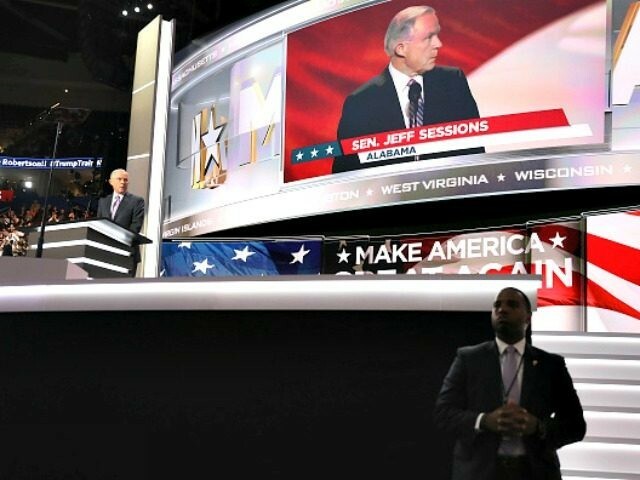 Alabama Senator Jeff Sessions took center stage on the first night of the Republican National Convention to discuss the conservative populist movement that has swept the nation and has inspired one of the most remarkable elections in U.S. history. Sessions declared that this election has been primarily about the critical issues of trade and immigration. Sessions has come to be regarded as the intellectual thought leader of the movement that propelled Trump to victory in the Republican primary. For years, Sessions– who was one of Trump’s earliest endorsers– has been the leading voice of the Republican Party on appealing to the blue collar voters who have been abandoned by their political leaders. Why is the only Republican in all of Congress who is complaining about this Jeff Sessions? […] Jeff Sessions is really the only guy standing up and complaining about it, warning before it happened, trying to alert people what’s on the verge of happening. Is Sessions the only conservative left in Congress? “Our middle class is steadily declining, with our African American and Hispanic communities being hurt the most. But, the Washington establishment, the media, and big corporations have been in denial,” Sessions said. Earlier during a Monday morning interview on MSNBC’s Morning Joe, Sessions explained how the leadership of the Republican Party stands at odds with the Republican electorate on these critical issues. When asked, Sessions said that House Speaker Paul Ryan “absolutely… needs to change” his position on trade. Last year, Ryan stood opposed to Sessions and acted as President Obama’s “partner” to fast track the Trans Pacific Partnership– even though by a nearly five-to-one margin Republican voters think so-called “free trade” deals lower wages rather than raise them. For 30 years, our good people have rightly pleaded for an end to the lawlessness, and for sound immigration policies that are fair and advance the national interest. To this legitimate plea, our elites have responded with disdain, dismissal, and scorn. But is there anyone in America that does not understand that when we bring in more workers than we have jobs for that job prospects and wages will fall? Top economists and the Congressional Budget Office have told us that. Is it too much to ask that we slow down and protect our national security and jobs? Let’s consider the facts. We lawfully admit 1.1 million permanent residents annually, more than any other country. In addition, we have 700,000 foreign guest workers taking jobs… From 2000 to 2014, while our existing population increased by millions, the number of jobs held by Americans actually declined. Amazingly, all the net job growth during that period went to immigrants. Combine that with the reality of efficient businesses, robots, and slow growth. The fact is, we don’t have enough jobs for the people who are here… Our duty as elected officials is to get our people jobs first. We are on the wrong track and the people know it. Yet, Hillary Clinton’s plan is more of the same: more government, more taxes, more regulation, more immigration, and more debt. She has been a champion of globalist trade agreements. But the facts are in. They have not worked for our people. When those agreements were signed, Presidents Clinton and Obama promised our dangerous trade deficits with China and Korea would be reduced. But, the deficit with China has increased five-fold and the deficit with Korea doubled. These are job-killing numbers. Worst of all, they are now pushing the disastrous 5,554-page Obamatrade – the Trans-Pacific Partnership agreement.